We are always looking for and developing new, creative, dairy-free recipes that we can prepare for our private chef clients. While not everyone that we work with is vegetarian, most of our clients are dairy free and enjoy plant based meals, with veggies being the main affair. Even if you are an omnivore and eat animal based protein, we recommend enjoying a meat-free meal every once in a while to give your digestive system a break from breaking down heavier foods. This recipe is inspired by and based on the original recipe by The First Mess. We’ve made a bunch of changes, the main ones beings that our version is grain free and contains more almond flour, increasing the protein content. You’ll also find our hempseed based pesto recipe here, instead of using pinenuts. If you want to make a complete meal, serve with a large, vibrant salad. 1. First chop the eggplant and saute in a pan with olive oil, until starting to get golden on the edges and soft. 2. In a food processor, pulse the chickpeas, almond meal, za’atar, garlic, parsley, lemon zest so everything is chopped up. Then add the sautéed eggplant to the food processor and pulse to integrate together (don’t blend completely, should have some pieces of eggplant still). 3. Form mixture into small balls (about 1 Tbsp each). It will make around 15 balls. 4. Place them on a parchment paper lined baking sheet and bake at 375 for 20-25 minutes. 5. Spread the cherry tomatoes out on a small baking sheet lined with parchment paper. Toss with a dash of extra virgin olive oil, sea salt and pepper. Roast in the oven at the same time as the meatballs, until they are cooked inside and starting to pucker on the outside. 6. While everything is baking, make the pesto by pulsing all ingredients together in the food processor. 7. 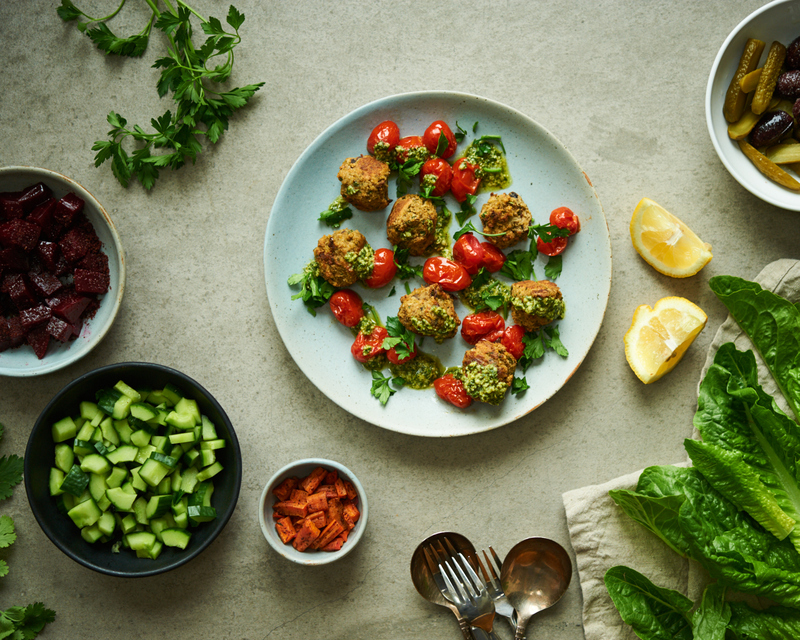 Serve the eggplant meatballs with roasted cherry tomatoes and drizzle the pesto over top.